The Idaho Transportation Department (ITD) donated $10,000 to the Utah and Idaho Chapter of the Cystic Fibrosis Foundation at a ceremony at the Thornton Interchange in eastern Idaho October 10. The prize money came to ITD when the Thornton project won the America’s Transportation Awards public vote earlier this fall. Pictured (L to R): Scott, Lina and Kim Robinson present the donation to Cystic Fibrosis Foundation representative Joe Wojciechowski. District Engineer Jason Minzghor (far right) served as event emcee. Watch the video of the event. 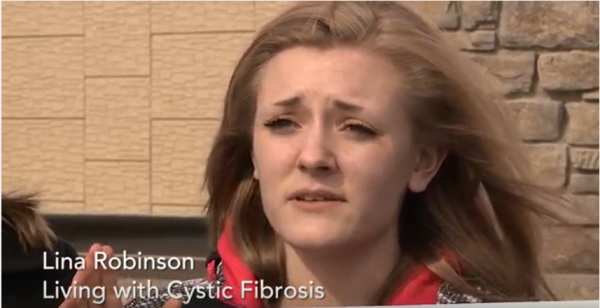 Now 20, Lina Robinson (daughter of D6 Maintenance Foreman Scott Robinson) has suffered with Cystic Fibrosis since birth. So far, there is no cure for the disease. The Cystic Fibrosis Foundation supports a wide range of research that focuses on the hunt for a cure and improving the quality of life for patients. The disease afflicts roughly 70,000 people worldwide. The Thornton Interchange on U.S. 20 south of Rexburg opened Nov. 18, 2016, marking completion of all the work needed to make the corridor a safe, modern highway. District 6 has completed 20 years of work along the 34-mile stretch of highway between Idaho Falls and Sugar City, closing 18 at-grade (level) intersections and constructing seven full interchanges. Despite traffic volumes more than doubling while the new interchanges were being built, the safety improvements decreased serious-injury crashes by 75% and reduced fatalities to less than one per year. Improvements furthered ITD’s mission of safety, mobility and economic opportunity for the traveling public, saving lives and reducing property damage. 1. President’s Transportation Award for Highway Traffic Safety – American Association of State Highway and Transportation Officials (AASHTO). 2. “People’s Choice” Award – America’s Transportation Awards. 3. Best Use of Technology and Innovation – Western Association of State Highway and Transportation Officials (WASHTO).